Vladimir Shiltsev recently received a medal and diploma signed by Lomonosov Foundation President Nikolai Laverov in recognition of Shiltsev’s election as an honorary member of the foundation. Fermilab scientist Vladimir Shiltsev was recently elected an honorary member of the Lomonosov Foundation. 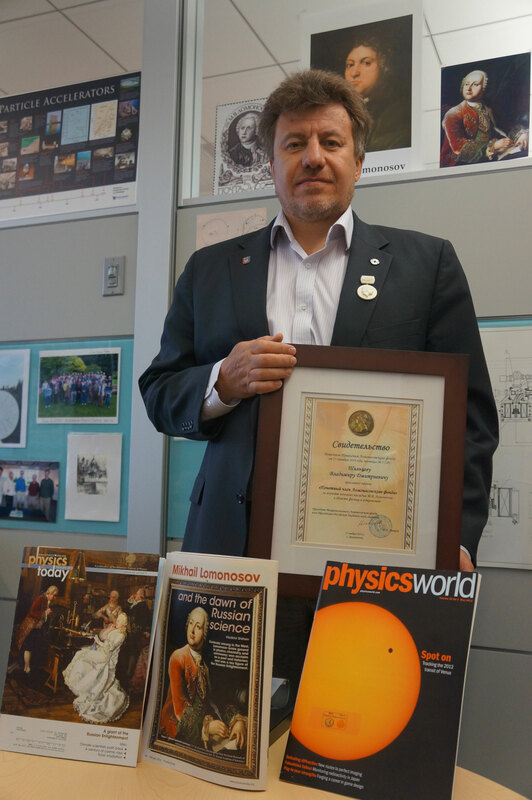 The foundation recognized Shiltsev and Stonybrook University Professor and Brookhaven National Laboratory Historian Robert Crease for their scholarly research of Mikhail Lomonosov’s heritage in physics and astronomy. Russian polymath Mikhail Lomonosov lived from 1711 to 1765 and is widely recognized as “the father of Russian science” for his seminal discoveries in chemistry and molecular physics, the first observation of the Venusian atmosphere, and the creation of modern Russian grammar and a new style of poetry. Over the past years, Shiltsev and Crease studied and published a number of articles on various accomplishments of Lomonosov in physics and astronomy. They also gave lectures, seminars and colloquia on the subject at various institutions in Russia, other European nations and the United States, including Fermilab, Princeton Plasma Physics Laboratory and SLAC National Accelerator Laboratory. The international Lomonosov Foundation was established in 1992 by North Arctic Federal University in Arkhangelsk, Russia, to encourage the revival of the best traditions of science, culture and education in the Russian North and scholarly research on Lomonosov’s heritage. It currently has more than 100 institutions and organizations in Finland, Germany, Russia, Sweden, the United States and other countries.